and simply threaded them one after the other. I repeated each unit five times so that each threading block has 20 warp ends. With multiple tabby threading, only one block weaves plain weave at a time. The plain weave block shifts in a diagonal fashion when the treadling is changed. I think you can make this out in the above photo if you look closely. I'll give the details of this draft in my next weaving post. Of course, I can't help but compare this to M's & O's. The most obvious thing is the number of warp ends skipped when the blocks are weaving the pattern (instead of plain weave.) The close-up on the left shows that in the multiple tabby system, two warp ends are skipped at a time. In M's and O's, three warp ends are skipped. Those skips in some way remind me of Summer & Winter, though not a lot. I will be curious to see what this looks like once it's off the loom and washed. OK, now I am getting intrigued. I see the diagonal and am wanting to see the draft. I like the colors too! How interesting!!! Can't wait to see the draft and the colors are wonderful! Great job!! I really like what you're doing. Was this something that just came to you or what was the inspiration? The colors are lovely. 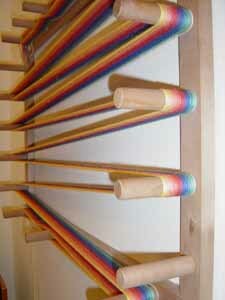 Marie, the inspiration was a combination of the rainbow dishtowels I wove and the m's & o's weaving system itself. More on that next post! Very interesting. I am assuming that your take up is the same across the warp since each section is going over and under the weft thread at the same rate. That, and you are rotating the pattern among the sections. What an interesting experiment. I really like the effect of the 'moving block' and I'm intrigued too by what is happening at the junction of the not-plain-weave blocks. Can't wait to see more!